CLICK HERE to download two rides from 75 Classic Rides Washington — Port Angeles-Lake Crescent Loop & Tonasket-Oroville-Palmer Lake Loop * 75 truly classic cycling routes range from family-friendly paved bicycle paths to epic mountain pass climbs * Full color with maps, photographs, and lively turn-by-turn descriptions From a 50-mile route around Orcas Island or a family trip along Seattle’s flat Burke-Gilman Trail, to a breathtaking climb up to Washington Pass from Winthrop—if you’re seeking the best road biking The Evergreen State has to offer, you can bet your bottom bracket you’ll find it in 75 Classic Rides: Washington. 75 Classic Rides is a new Mountaineers Books series authored by passionate local cyclists who’ve put thousands of miles on their bikes to bring you the very best road cycling routes across their given state. The focus is on one-day rides (a mix of loops and one-way courses), but you’ll also find suggestions for link-ups and some inspiring, longer routes for touring, including at least one cross-state route. Terrain varies from flat paved trails to epic mountain challenges. Each route description starts with the basic essentials to get you going: a brief overview, full-color map, elevation profile, difficulty level, round-trip distance, road conditions, and advice on the best season to ride. Full narrative descriptions tell what sights to expect, best towns for food or a cup of coffee, safety info on road shoulders and bike lanes, as well as turn-by-turn descriptions and mileage logs. 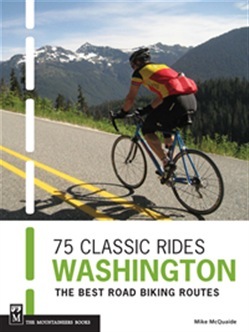 Sample routes in 75 Classic Rides: Washington include: * Packwood–Paradise–Stevens Canyon * Skagit (Mostly) Flats * Hurricane Ridge * Yakima Canyon * Walla Walla–Middle Waitsburg Loop Click here for cue sheets for 75 Classic Rides Washington! Acquista 75 Classic Rides Washington in Epub: dopo aver letto l’ebook 75 Classic Rides Washington di Mike Mcquaide ti invitiamo a lasciarci una Recensione qui sotto: sarà utile agli utenti che non abbiano ancora letto questo libro e che vogliano avere delle opinioni altrui. L’opinione su di un libro è molto soggettiva e per questo leggere eventuali recensioni negative non ci dovrà frenare dall’acquisto, anzi dovrà spingerci ad acquistare il libro in fretta per poter dire la nostra ed eventualmente smentire quanto commentato da altri, contribuendo ad arricchire più possibile i commenti e dare sempre più spunti di confronto al pubblico online.